Trending at $44.32eBay determines this price through a machine learned model of the product's sale prices within the last 90 days. Condition is New. Protective white solar shields allow normal air flow while protecting sensor from direct sunlight for accurate temperature readings and eliminating the need for regular cleaning and maintenance of the weather station. , 9hour 59min (Max.). Water Connection: 21mm tap with 26.5mm thread. Operation: Auto Operation, Manual Operation. Hose Connection: 13mm(1/2"). Work Pressure: 0-400kpa. 1 x User Manual. Water Temperature: 0-40°C. New Sealed Orbit Iris 1 Hose Faucet Water Timer Works w/ Iris Smarthub 27087-03. Condition is New. Shipped with USPS Priority Mail. It has never been used or installe d except for when I plugged it in for testing. By turning the dial to each zone, you can easily set more or less watering for full sun and shaded areas, or water slopes and clay soils in short intervals to allow water to soak in, avoiding runoff. WiFi Connectivity. Bypass Rain Sensor for any station gives you the ability to customize which stations react to a rain sensor. Plastic wall-mount cabinet with door. Remote accessory port for Rain Bird approved accessory devices. Operates on 120V can be used up to a 1000W Ballast. DIGITAL BALLAST. 15 minute On/Off. Automated lighting for consistent hours of light. T5 FIXTURES. DOUBLE ENDED REFLECTOR & SYSTM. ETL Listed and Certified. 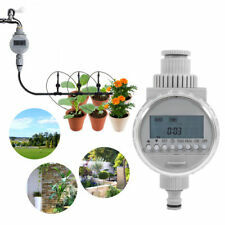 Automatic Drip Irrigation Plant Kit Self Watering Can Timer System Indoor Garden. NEW Hunter Sprinkler PCM 300 3 Station Module for Pro-C Series Controllers . Condition is New. Shipped with USPS First Class Package. 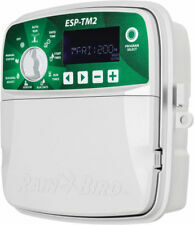 Rain Bird Indoor Irrigation Timer Model: SST-600i. Dispatched with USPS Priority Mail Padded Flat Rate Envelope. A rain delay is built into the run program function. A manual button allows program interruption. Number of Watering Programs. 3/4" hose thread installs to outdoor faucet. Easy to program and use. We apologize for any inconvenience this may cause. RainMachine Mini-8, Cloud Independent, The Forecast Sprinkler, Wi-Fi Irrigation. Condition is Used. Shipped with USPS Priority Mail. For Sale is a Hunter 6 Zone Sprinkler Clock SRC 600I. This item is in good used condition. Does not come with the power supply. Connects to a standard hose faucet. HUNTER XC - MODEL XC-800I - IRRIGATION LAWN SPRINKLER CONTROLER - INDOOR USE. Condition is Used. Shipped with USPS Priority Mail. 240 volt TIMER 24hr 1 Single Outlet 24 hour 240v Programmable Control FREE SHIP! It has a manual override to allow you to turn it on or off without changing the current timing -. Check and MO's are also accepted. Features: It is so convenient and easy to use it. Support full waterproof function. Perfect for using outdoors. Support temporary watering function (does not affect the set of good procedures) Suitable for the control of irrigation systems in the domestic sector, such as lawn sprinkler, sprinklers, drip house, etc. .
Hand Tools And Tool Accessories. Lawn / Garden / Farm Supplies. Brass ergo swivel coupling. No batteries required. Notions And Miscellaneous. Replaced with a WiFi model I got as a gift. This one works perfectly. Looks and works like new. Includes what you see in the pictures and the charger. 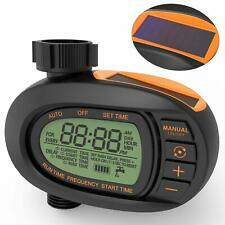 Hunter Pro-C PCC-900i 9-Station Sprinkler Controller and Solar Sync. Condition is Used. Shipped with USPS Priority Mail. New, un-used, but no box. Been in storage. Digital display with lighted buttons allows you to review settings at a glance. Irrigation and Fittings. > Impurity water allowed,attached to 3/4"(19mm) or 1"(25mm) tap or faucet. View All Categories. We want to make your garden life wonderful. Gardeen Tool. This does not affect your statutory rights. Features:Rain delay for water conservation.Extra-large LCD display, easy to read.Super-simple programming gives flexible control of watering duration and frequency.Heavy Duty weatherproof construction, durable for use.Easy to set up and use, low power consumption.Descriptions:Simple, easy installation and programming. There is no need for tools.Construction with irrigation applications in gardens, yards, greenhouses, flowerbeds, and etc.Specifications: Material: plasticColor: greenSize: 150x95x55mmPackage size: 170x125x75mmPackage Included:1 x Electronic Water Timer 1 x User ManualNotes:The real color of the item may be slightly different from the pictures shown on website caused by many factors such as brightness of your monitor and light brightne. Looks new no box, January 2016 New other,, 6 zone Rainbird Expansion module. Wifi, or Non Wifi. Trending at $21.01eBay determines this price through a machine learned model of the product's sale prices within the last 90 days.